This article is about the operating system by Mozilla. For other uses, see Firefox (disambiguation). Firefox OS was publicly demonstrated in February 2012, on Android-compatible smartphones. By December 16, 2014, fourteen operators in 28 countries throughout the world offered Firefox OS phones. On December 8, 2015, Mozilla announced that it would stop sales of Firefox OS smartphones through carriers. Mozilla later announced that Firefox OS smartphones would be discontinued by May 2016, as the development of "Firefox OS for smartphones" would cease after the release of version 2.6. Around the same time, it was reported that Acadine Technologies, a startup founded by Li Gong (former president of Mozilla Corporation) with various other former Mozilla staff among its employees, would take over the mission of developing carrier partnerships, for its own Firefox OS derivative H5OS. In January 2016 Mozilla announced that Firefox OS would power Panasonic's UHD TVs (as previously announced Firefox OS "would pivot to connected devices"). In September 2016 Mozilla announced that work on Firefox OS had ceased, and that all B2G-related code would be removed from mozilla-central. On July 25, 2011, Andreas Gal, Director of Research at Mozilla Corporation, announced the "Boot to Gecko" Project (B2G) on the mozilla.dev.platform mailing list. The project proposal was to "pursue the goal of building a complete, standalone operating system for the open web" in order to "find the gaps that keep web developers from being able to build apps that are – in every way – the equals of native apps built for the iPhone, Android, and Windows Phone 7." The announcement identified these work areas: new web APIs to expose device and OS capabilities such as telephone and camera, a privilege model to safely expose these to web pages, applications to prove these capabilities, and low-level code to boot on an Android-compatible device. This led to much blog coverage. According to Ars Technica, "Mozilla says that B2G is motivated by a desire to demonstrate that the standards-based open Web has the potential to be a competitive alternative to the existing single-vendor application development stacks offered by the dominant mobile operating systems." In 2012, Andreas Gal expanded on Mozilla's aims. He characterized the current set of mobile operating systems as "walled gardens" and presented Firefox OS as more accessible: "We use completely open standards and there’s no proprietary software or technology involved." (That changed in 2014; see Digital rights management (DRM), below.) Gal also said that because the software stack is entirely HTML5, there are already a large number of established developers. This assumption is employed in Mozilla's WebAPI. These are intended W3C standards that attempt to bridge the capability gap that currently exists between native frameworks and web applications. The goal of these efforts is to enable developers to build applications using WebAPI which would then run in any standards compliant browser without the need to rewrite their application for each platform. In July 2012, Boot to Gecko was rebranded as 'Firefox OS', after Mozilla's well-known desktop browser, Firefox, and screenshots began appearing in August 2012. In September 2012, analysts Strategy Analysts forecast that Firefox OS would account for 1% of the global smartphone market in 2013 – its first year of commercial availability. In February 2013, Mozilla announced plans for global commercial roll-out of Firefox OS. Mozilla announced at a press conference before the start of Mobile World Congress in Barcelona that the first wave of Firefox OS devices will be available to consumers in Brazil, Colombia, Hungary, Mexico, Montenegro, Poland, Serbia, Spain and Venezuela. Mozilla also announced that LG Electronics, ZTE, Huawei and TCL Corporation had committed to making Firefox OS devices. In December 2013, new features were added with the 1.2 release, including conference calling, silent SMS authentication for mobile billing, improved push notifications, and three state settings for Do Not Track. Async Pan and Zoom (APZ), included in version 1.3, should improve user interface responsiveness. Work is currently being done to optimize Firefox OS to run a 128 MB platform with version 1.3T. A 128 MB device is out that seems to use that version but it may be unfinished. In 2015, Mozilla ported Firefox OS (an "experimental version") to MIPS32 to work in a sub-$100 tablet (that can also run Android 4.4 KitKat). Mozilla has worked on developing the OS for Smart Feature Phones. Firefox OS was discontinued in January 2017. In 2014, Gal announced a change in course, writing that future versions of the Firefox browser would include DRM. Implementation of DRM in the Firefox browser began with version 38. In August 2015, attempts by Matchstick TV (based on Firefox OS) to add DRM caused the demise of Matchstick, a decision that Boing Boing called "suicide-by-DRM". At Mobile World Congress 2012, Mozilla and Telefónica announced that the Spanish telecommunications provider intended to deliver "open Web devices" in 2012, based on HTML5 and these APIs. Mozilla also announced support for the project from Adobe and Qualcomm, and that Deutsche Telekom’s Innovation Labs will join the project. Mozilla demonstrated a "sneak preview" of the software and apps running on Samsung Galaxy S II phones (replacing their usual Android operating system). In August 2012, a Nokia employee demonstrated the OS running on a Raspberry Pi. Firefox OS is compatible with a number of devices, including Otoro, PandaBoard, Emulator (ARM and x86), Desktop, Nexus S, Nexus S 4G, Samsung Galaxy S II, Galaxy Nexus and Nexus 4. A MIPS port was created by Imagination Technologies in March 2015. In December 2012, Mozilla rolled out another update and released Firefox OS Simulator 1.0, which can be downloaded as an add-on for Firefox. The latest version of Firefox OS Simulator, version 4.0, was released on July 3, 2013 and announced on July 11, 2013. Mozilla's planned US$25 Firefox smartphone displayed at MWC, is built by Spreadtrum. Mozilla has collaborated with four handset makers and five wireless carriers to provide five Firefox-powered smartphones in Europe and Latin America so far with cellphone launches being led by UK marketer John D. Bernard. In India, Mozilla planned a launching at $25 in partnership with Intex & Spice, but the price ended up being $33 (converted from 1,999 Rupees). Gonk consists of a Linux kernel and user-space hardware abstraction layer (HAL). The kernel and several user-space libraries are common open-source projects: Linux, libusb, BlueZ, etc. Some other parts of the HAL are shared with the Android project: GPS, camera, among others. Gonk is basically an extremely simple Linux distribution and is therefore from Gecko's perspective, simply a porting target of Gecko; there is a port of Gecko to Gonk, just like there is a port of Gecko to OS X, and a port of Gecko to Android. However, since the development team have full control over Gonk, the developers can fully expose all the features and interfaces required for comprehensive mobile platforms such as Gecko, but which aren't currently possible to access on other mobile OSes. For example, using Gonk, Gecko can obtain direct access to the full telephony stack and display framebuffer, but doesn't have this access on any other OS. Panasonic will continue to develop the operating system for use in their Smart TVs, which run My Home Screen, powered by the Firefox OS. Acadine Technologies has derived their H5OS from Firefox OS as well. Li Gong, the founder of the company, had overseen the development of Firefox OS while serving as president of Mozilla Corporation. A fork called KaiOS has been used on a few feature phones, including Alcatel's OneTouch Go Flip (known as Cingular Flip 2 on AT&T), Reliance Jio's JioPhone (LYF F30C), and Intex's Turbo+ 4G. Primary features of the system is to bring support of 4G LTE, Wi-Fi, GPS and Wi-Fi with HTML5-based apps and longer battery life onto non-touch devices with optimized user interface, less memory and energy. Chris Ziegler of the technology blog The Verge wrote that Firefox OS would take app distribution to pre-iPhone era, requiring application developers to deal with multiple carriers and their app stores. At the Mobile World Congress, Mozilla's CEO Gary Kovacs said that Firefox OS has the advantage that users need not install an app to use it. Mozilla sought to make the most of this with the search functionality built into Firefox OS, a core feature of the platform. Janne Lindqvist, a mobile security researcher at the Rutgers University WINLAB, expressed concern about the discovery mechanism of a Web-based platform, but a Mozilla spokesperson stated that Mozilla required developers to "package downloadable apps in a zip file that has been cryptographically signed by the store from which it originated, assuring that it has been reviewed." In addition, "apps coming back from search are given only limited access to device programming interfaces and applications, unless the user grants permission for further access." The structural similarities between Firefox OS and Android allow the Mozilla platform to run on a number of devices that ship with Android. While some ports of Firefox OS are hardly different from their original versions, others are heavily modified to fit the device in question. There are quite a few to note that are specifically made for Firefox OS as stated above. There are some that are designed for the developers themselves and others that are consumer-phones. There are also emulators for testing both apps and the OS itself on the desktop which are designed for both OS testing and the developers themselves. ^ a b "Mozilla Licensing Policies". Mozilla. ^ "The first mobile in Spain with Firefox OS. Geekphone Keon y Peak". January 22, 2013. ^ a b "Firefox OS". Mozilla. August 21, 2012. Retrieved September 17, 2012. ^ Olson, Parmy (April 15, 2013). "Want to Buy A Webphone?". Forbes (paper). p. 52. ^ Dotzler, Asa (January 6, 2014). "Mozilla Launches Contribution Program to Help Deliver Firefox OS to Tablets". Retrieved March 19, 2014. ^ "Now you can buy a Panasonic Smart TV with Firefox OS (in Europe)". Liliputing. May 15, 2015. Retrieved April 7, 2019. ^ "Mozilla and Partners to Bring Firefox OS to New Platforms and Devices". Mozilla Corporation. January 6, 2014. ^ a b c d Gal, Andreas (June 25, 2011). "Booting to the web". mozilla.dev.platform (Mailing list). Retrieved November 20, 2011. ^ Lunden, Ingrid. "Mozilla Will Stop Developing And Selling Firefox OS Smartphones - TechCrunch". ^ a b Hoffman, Chris (September 28, 2016). "Mozilla is stopping all commercial development on Firefox OS". PCWorld. Archived from the original on January 16, 2017. Retrieved April 7, 2019. ^ "B2G OS". developer.mozilla.org. Retrieved April 3, 2019. ^ a b Shankland, Stephen (December 10, 2015). "Startup picks up the torch for troubled Firefox OS". CNET. Retrieved December 12, 2015. ^ a b Ginny Maies (February 28, 2012). "First Look at Mozilla's Web Platform for Phones: 'Boot to Gecko'". PCWorld. Retrieved March 23, 2012. ^ "Mozilla making mobile OS using Android". blog. I Didn't Know That!. July 2011. Retrieved August 4, 2011. ^ "Firefox OS Expands to Nearly 30 Countries". Mozilla Corporation. December 16, 2014. ^ "Firefox OS smartphones are dead". ^ "Firefox OS/Connected Devices Announcement". Mozilla. Retrieved February 5, 2016. This means that Firefox OS for smartphones will no longer have staff involvement beyond May. [..] As of today, we have 3 projects that have passed the first gate including SmartTV, and about a dozen more projects are prepping for review. ^ Shankland, Stephen (December 10, 2015). "Startup picks up the torch for troubled Firefox OS". CNET. Retrieved December 12, 2015. ^ "Firefox OS will Power New Panasonic UHD TVs Unveiled at CES – The Mozilla Blog". The Mozilla Blog. ^ "B2G OS and Gecko Announcement from Ari Jaaksi & David Bryant". September 27, 2016. Retrieved September 27, 2016. ^ "The Firefox Phone? Mozilla Working on Android-Esque OS". blog. Gagagadget. July 26, 2011. Retrieved August 4, 2011. ^ Andrew Kameka (July 26, 2011). "Mozilla borrows from Android to create its own mobile operating system". blog. androinica. Retrieved August 4, 2011. ^ Ryan Paul (July 26, 2011). "Mozilla eyes mobile OS landscape with new Boot to Gecko project". Ars Technica. Retrieved August 4, 2011. ^ a b c "Mozilla's Boot 2 Gecko and why it could change the world - Features". Know Your Mobile. March 2, 2012. Retrieved August 18, 2012. ^ "WebAPI - MozillaWiki". Wiki.mozilla.org. Retrieved June 14, 2013. ^ Brown, Mark (August 8, 2012). "Mozilla's HTML5 phone platform now called Firefox OS, launching 2013 (Wired UK)". Wired.co.uk. Archived from the original on July 5, 2012. Retrieved August 18, 2012. ^ "Mozilla shows off Firefox OS screenshots". The Inquirer. Retrieved August 18, 2012. ^ "Firefox OS to Capture 1 Percent Share of Global Smartphone Market in 2013". Strategy Analytics. Archived from the original on October 24, 2012. Retrieved September 27, 2012. ^ "Mozilla Announces Global Expansion for Firefox OS". mozilla. February 24, 2013. Retrieved March 27, 2013. ^ "Mozilla reveals Firefox smartphone launch partners". BBC. February 24, 2013. Retrieved March 28, 2013. ^ "Firefox OS 1.2 for developers". Mozilla Developer Network. ^ "Intex Cloud FX - Smartphone with Mozilla Firefox OS 1.3T". Firefox OS Devices. ^ Shah, Agam (March 23, 2015). "Imagination floats sub-$100 MIPS tablet running Firefox OS". PC World. IDG News Service. Retrieved June 5, 2015. ^ "Is there a market for the new Smart Feature Phones? - Firefox OS Central". Retrieved September 18, 2015. ^ Doctorow, Cory (May 14, 2014). "Firefox's adoption of closed-source DRM breaks my heart" – via The Guardian. ^ "Watch DRM content on Firefox - Firefox Help". support.mozilla.org. ^ "Open "Chromecast killer" committed suicide-by-DRM". Boing Boing. ^ "Telefónica and Mozilla pioneer first Open Web Devices" (Press release). Telefónica. February 27, 2012. Retrieved March 23, 2012. ^ "Mozilla in Mobile – the Web is the Platform" (Press release). Mozilla. February 27, 2012. Retrieved March 23, 2012. ^ Chloe Albanesius (February 28, 2012). "Mozilla Tackles Walled Gardens, Demos 'Boot to Gecko' Mobile OS". PCMag.com. Retrieved March 23, 2012. ^ "Raspberry Pi now comes in Firefox OS flavour". Theregister.com. Retrieved September 15, 2012. ^ "B2G Build Prerequisites". Mozilla Developer Network. Retrieved September 9, 2012. ^ "Firefox OS ported to MIPS on Ingenic tablet". LinuxGizmos. ^ "Firefox OS Simulator :: Versions :: Add-ons for Firefox". Retrieved July 15, 2013. ^ Angelina Fabbro (July 11, 2013). "Firefox OS Simulator 4.0 released ✩ Mozilla Hacks – the Web developer blog". Retrieved July 15, 2013. ^ "Spreadtrum planning a $25 Firefox OS smartphone". GSMArena.com. ^ "Mozilla to launch $25 phone in India in partnership with Intex & Spice". IndianWeb2.com. Retrieved June 18, 2014. ^ Bianca Vázquez Toness, Bloomberg News (August 25, 2014). "Mozilla debuts $33 Cloud FX smartphone in bid to capture Indian market". Financial Post. ^ a b c d "B2G/Architecture wiki page". MDN. Mozilla. September 3, 2014. Archived from the original on June 4, 2014. Retrieved November 5, 2014. ^ a b c "Release Management/B2G Landing - MozillaWiki". MozillaWiki. Retrieved July 23, 2015. ^ "B2G/Roadmap". Retrieved August 16, 2015. ^ "Release Management/B2G Landing". mozilla.org. ^ a b "Index of /pub/mozilla.org/b2g/manifests/". Mozilla FTP server. Retrieved June 18, 2018. ^ "Firefox OS Update (1.1) Adds New Features, Performance Improvements and Additional Language Support | Future Releases". Mozilla. Retrieved October 10, 2013. ^ "Platform/2013-10-01". Retrieved August 16, 2015. ^ "T3 Smackdown: Sony KD-65ZD9 vs LD OLED65E6 vs Panasonic TX58DX802B". Retrieved April 26, 2017. ^ Horwitz, Josh (July 16, 2015). "Ex-Mozilla employees are teaming up with the Chinese government to kill Android". Quartz. Retrieved December 12, 2015. ^ "Alcatel GO FLIP™". June 16, 2017. ^ "The Cingular Flip 2 is AT&T's newest clamshell phone". ^ "Reliance Jio LYF 4G VoLTE feature phone: To run KaiOS, will have an app store too". July 20, 2017. ^ "[Exclusive] Reliance Jio and Lyf's 4G VoLTE Feature Phone". July 13, 2017. ^ "Jio Phone Booking - Pre Book Jio Mobile Online for 500 Only - Jio". www.jio.com. ^ "Intex Unveils 4G-Volte Feature Phone". Mobility India. August 1, 2017. ^ "KaiOS, Here's everything you should know about the operating system available in JioPhone — Mobile Studio". August 24, 2017. ^ "Fox Chase » Linux Magazine". Linux Magazine. Retrieved January 10, 2016. ^ "Firefox OS Shows Continued Global Growth". The Mozilla Blog. Retrieved January 10, 2016. ^ Chris Ziegler (February 27, 2013). "With Firefox OS, Mozilla gets a little dirty to clean the mobile web". The Verge. Retrieved June 14, 2013. ^ Chris Ziegler (February 28, 2013). "Certified 'Powered by Firefox OS' devices require Firefox Marketplace, minimum hardware specs". The Verge. Retrieved June 14, 2013. ^ Parfeni, Lucian (February 25, 2013). "Mozilla Explains Why Firefox OS Apps Are Fundamentally Better than Native Mobile Apps". softpedia. Retrieved April 7, 2019. ^ Talbot, David (February 28, 2013). "Security Researchers Raise Questions on How Mozilla's Web-Centric Firefox Mobile OS Will Stop Malicious Web Apps | MIT Technology Review". Technologyreview.com. Retrieved June 14, 2013. ^ a b "Geeksphone". Mozilla Developer Network. ^ "Flame". Mozilla Developer Network. ^ "ZTE Open - Mozilla". Retrieved August 27, 2015. ^ "ZTE Open C - Mozilla". Retrieved August 27, 2015. ^ "Alcatel Onetouch Fire C 4020D". Mozilla Developer Network. ^ "APC » Paper". apc.io. ^ "Cherry Mobile Ace Specs". CherryMobile.com. Retrieved September 19, 2016. ^ "Intex Cloud FX". Mozilla Developer Network. ^ "Fx0". Mozilla Developer Network. ^ "Spice Fire One MI FX1". Mozilla Developer Network. ^ "Spice Fire One Mi-FX 2 Firefox OS smartphone launched for Rs. 2,799". tech4me.in. May 14, 2015. Archived from the original on February 1, 2017. Retrieved April 7, 2019. ^ "Symphony GoFox F15". Mozilla Developer Network. ^ HTC Pico/Explorer unofficial port. "[B2G][FIREFOX OS] For HTC Explorer". ^ a b "[ROM][Dragonsphere Team][B2G][HTML5][NO ANDROID]Firefox OS [OFICIAL BUILD][B009](NEW UPDATE:Flasheable+APN FIX)". MoDaCo. April 11, 2014. Retrieved January 23, 2015. ^ Kevin Parrish. "Experimental Firefox OS Build Can Run On MIPS Hardware". Tom's Hardware. ^ "Firefox OS now running on a MIPS-based reference tablet". Imagination Blog. ^ "Moto G - Firefox OS Central". Archived from the original on October 2, 2015. Retrieved September 30, 2015. ^ "[October 27] FirefoxOS (nexus 4) 1.1 - 2.2 -… - Google Nexus 4 - XDA Forums". XDA Developers. ^ "[B2G] FireFox OS - Nightlies [11/Jun/2014]". XDA Developers. 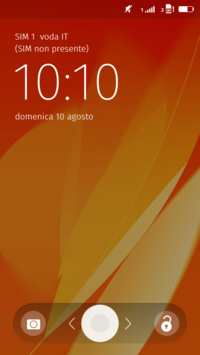 ^ "[ROM][OCT 11] FirefoxOS 1.2 and 1.3". XDA Developers. ^ Alvarez, Edgar. "Sony begins exploring Firefox OS, dares Xperia E owners to experiment with new ROM". Engadget. Retrieved October 24, 2014. ^ Free Xperia Project, -. "Firefox OS on SP". Archived from the original on August 11, 2014. ^ "Firefox OS Port For Sony Devices". Archived from the original on October 2, 2015. Retrieved September 30, 2015. Wikimedia Commons has media related to Firefox OS.